The taekwondo instructor at Master Bill Jones Tae Kwon Do Academy has been a fierce competitor in championships around the world. He has won over 347 championships, 52 gold medals, 10 times competitor of the year, 17 time world champion, and has been undefeated in forums and Weapons since 1981. All Grand Master Jones students that have competed have won over 500 championships with a 100% success rate. Read on to see testimonials about our martial arts courses and to learn more about our martial arts studio in Concord, CA. “My family and I were students at Master Bill Jones Tae Kwon Do Academy and our experience there was nothing short of amazing. 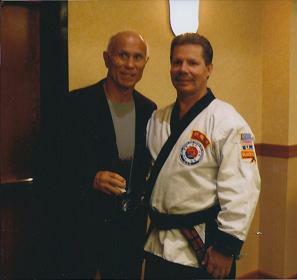 Unlike many martial arts schools, everyone was able to train directly with Master Bill Jones himself. What an honor it was to be able to have hand to hand instruction with this great man. My family and I found Master Jones to be a very pleasant, funny, and knowledgeable man. When training with Master Jones, you not only get to learn Tae kwon Do, but oftentimes he would treat us with learning other skills in the various other martial arts he holds black belts in. From time to time we even were given classes in various weapons training. So many good things could be said about Master Bill Jones and his Academy, but I would like to highlight these things as they stuck out most to me. Master Bill Jones is GREAT teacher, knowledgeable, fun, patient, pleasant. The Dojang is well kept and VERY VERY clean. The other students were very respectful as Master Jones commands respect. The skills taught here are no joke. This is the real thing. You get what you pay for and the prices are comparable or better than what other schools charge. As long as you give your best, you'll get a great martial arts education with Master Jones.